View More In Bathroom Sinks - Page 4. 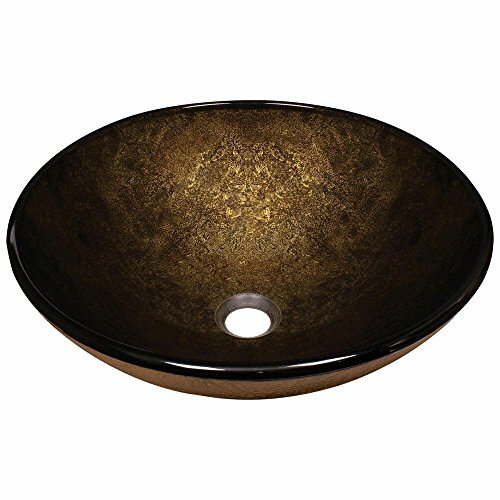 This 1/2" thick, tempered-glass vessel is circular with an inlaid foil of deep bronze and gold, creating a smooth, royal, interior appearance and a textured, golden exterior. Its non-porous surface is extremely attractive and sanitary - naturally resistant to stains, odors, discoloration, and heat damage. With an overall measurement of 16 1/2" x 16 1/2" x 5 3/4", it will require a minimum-width cabinet of 18". This listing does not include any accessories.